Sometimes the best food experiences happen when you least expect. With 90 minutes to squeeze in a quick pre-theatre meal before heading to my good friend Gary McNair‘s new one-man-show at the Arches, Craig and I decided to pop into Carluccio’s on West Nile St for a decent Italian feed. I’d visited the thriving nationwide restaurant chain of Antonio Carluccio a couple of times since this one opened about 18 months ago and I really invested in the energetic, buzzy atmosphere of the place. The food was always above average, too, but for some reason I was never expecting anything spectacular – probably because I was making comparisons with Jamie Oliver’s Jamie’s Italian. Perusing the menu, I was set on choosing something different – having had the Penne Giardiniera more than once previously – and on spotting a venison pasta dish, my decision was made. To me, Antonio Carluccio’s food represents provincial Italian fare, and the Tortelloni di Cervo is exactly what I’d envisage him creating with gusto on ‘Two Greedy Italians’. Arriving at my table, the dish had an understated appeal which spoke to me of anticipation; the star ingredient was modestly tucked away inside those golden parcels, gleaming with a simple buttery coating. 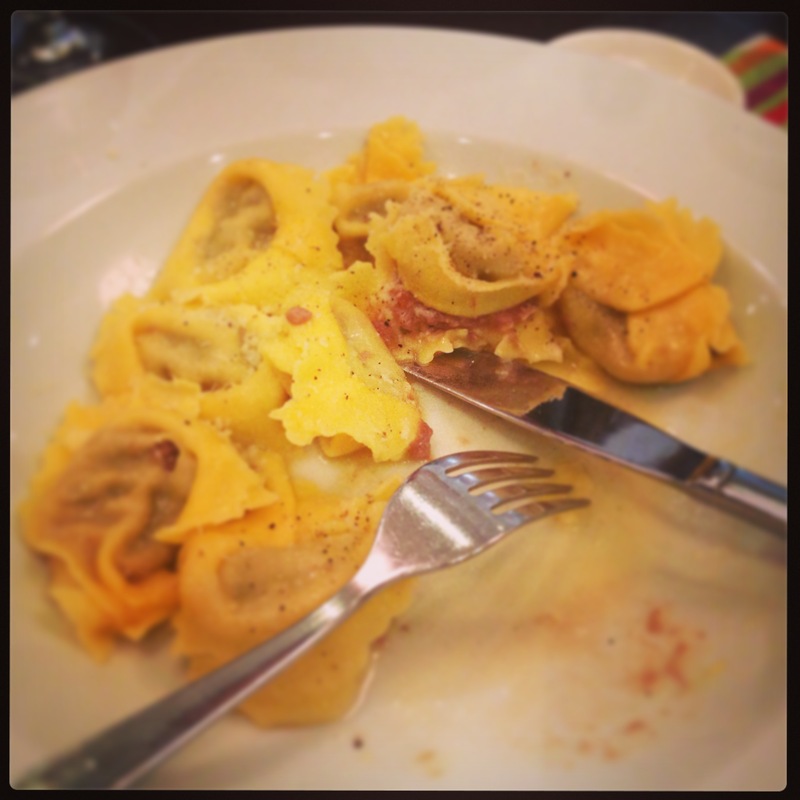 With a light dusting of fresh parmigiano and cracked black pepper, the tortelloni were ripe for testing. Rich, earthy and full-flavoured, the delectable pockets of red wine-braised venison also had a melting sweetness which delivered perfectly balanced flavour with every mouthful. Given that I’m an all-out carnivore, this is genuinely one of the most satisfying pasta dishes I’ve ever had the pleasure of eating. Despite my best intentions of trying something new every time I revisit a restaurant, my senses tell me there’s little chance I’ll be overlooking the Tortelloni di Cervo on my next sojourn to Carluccio’s. All I can do is urge you to try it! Categories: Eating out | Tags: Antonio Carluccio, Carluccio's, Cooking, food, Gary McNair, Glasgow, Italian, Jamie Oliver, Jamie's Italian, pasta, Penne Giardiniera, Restaurant, review, Tortelloni, Tortelloni di Cervo, Two Greedy Italians | Permalink. My mum has just returned from a week’s hillwalking in the snowy Dolomites and was kind enough to bring me back a really interesting selection of local produce. 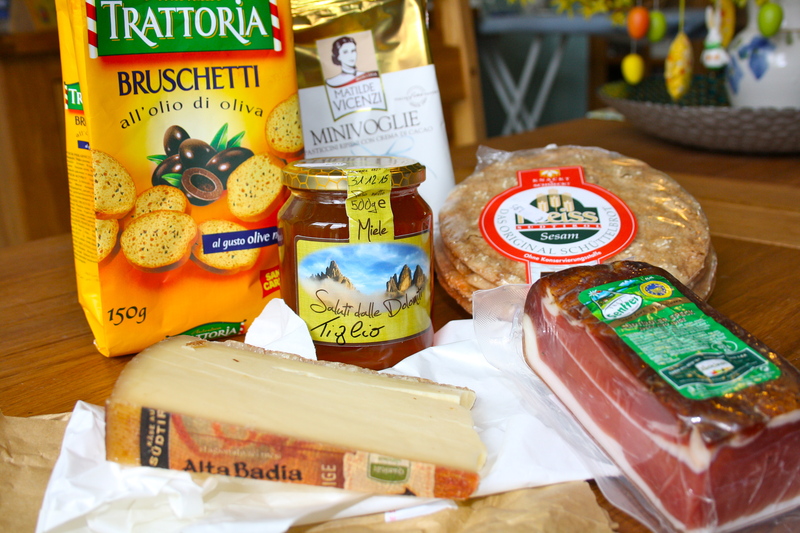 The South Tyrol region in the north of Italy is a real melting pot of Italian, Austrian and German influences – having been part of Austria prior to the First World War – and this is made very apparent through the cheeses, meats, breads and biscuits produced in the area. 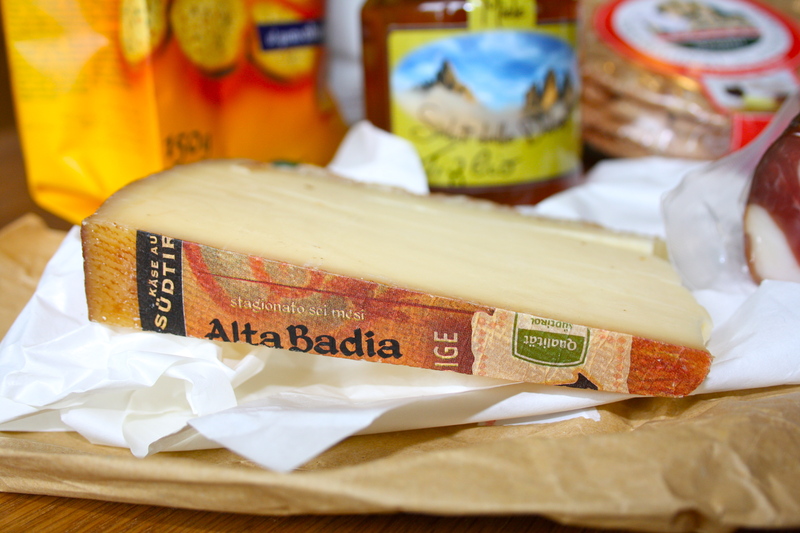 This unpasteurised hard cows cheese, Alta Badia, is matured for 180 days and named after the lush Alta Badia valley it hails from. Smooth, nutty and firm, it bears more than a passing resemblance to gruyère – although less sharp – and is completely delicious! I’ll be having this generously melted over a crouton basking gloriously atop Nigel Slater’s French onion soup. 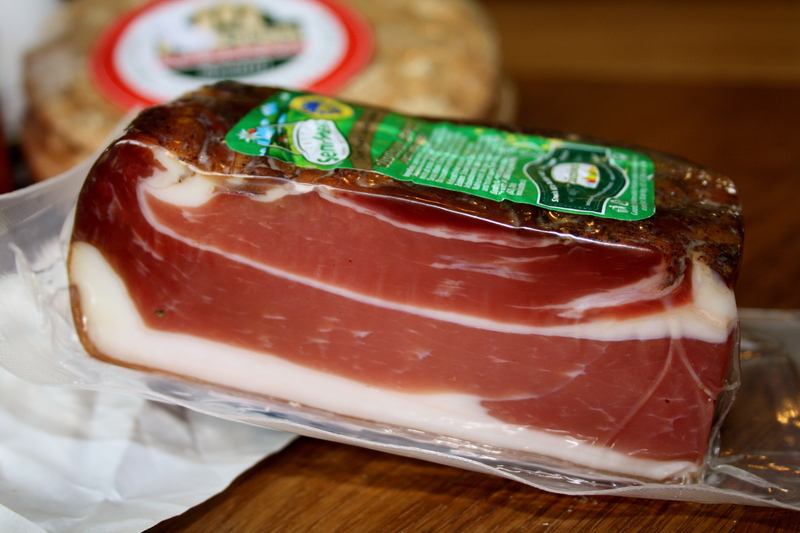 I’m probably most looking forward to trying this Südtiroler Speck, a juniper-infused cured and smoked ham which is unique to the area and has been afforded protected geographical indication (PGI) status. Sliced paper-thin, it’s essentially prosciutto, but I also fancy chopping it up into lardons and serving it as a tasty addition to salads and brussel sprouts. I think I hear coq au vin calling, too. 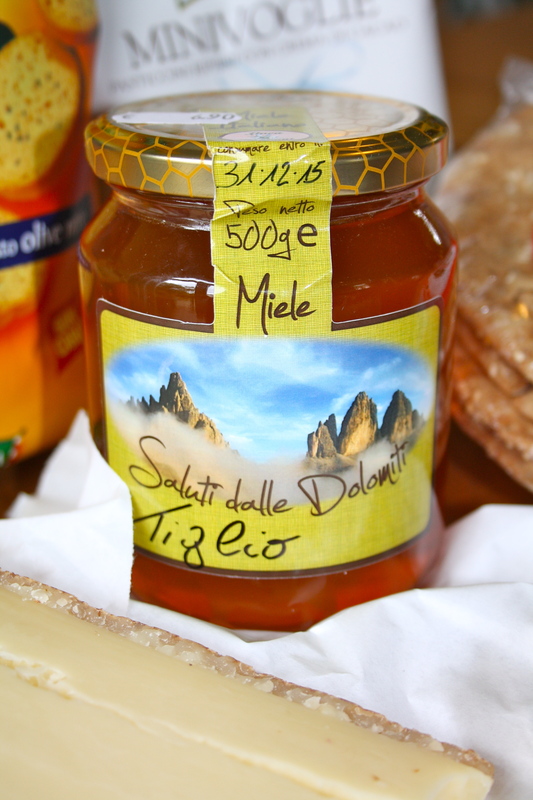 Judging by the lush and rich landscape of the Dolomites, this honey is bound to be something pretty special. I’m fantasising about marrying salty and sweet by drizzling it over grilled halloumi and figs – if it lasts out until they come into season this summer. Until then, I’m hoping it’ll re-energise my old faithful midweek dinner of honey mustard chicken. Now I just need to find the time to get to work in the kitchen with all of these beautiful ingredients. So much food, so little time! Categories: Travel | Tags: Dolomites, French, French onion soup, German, gruyère, Italian, Italy, Nigel Slater | Permalink.